Border Movement Lounge showcases established and upcoming artists and producers of electronic music from across South Asia and Germany. The event also explores different heritage buildings, ranging from the Burdwan Palace to Hooghly Jute Mill, in order to show alternative, artistic use of these beautiful structures and inspire new life for them. This time we are hosting it at the old Gem Cinema Hall. 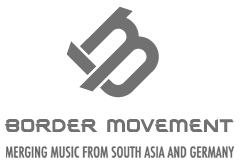 Border Movement Lounge is a platform to showcase established and upcoming artists and producers from across South Asia. The lounge is an informal event format that hopes to foster a more open and interactive culture of electronic music performance, as well as a more well-rounded appreciation from the local music community. Each edition of Border Movement Lounge will focus on a different area of the region, partnering acts with local talent. Previous editions of the lounge have taken place in Berlin, Colombo, Karachi, New Delhi, Mumbai, Kolkata and more will be popping up around South Asia shortly.